the nytpicker: Sunday NYT Book Reviewer Accidently Attributes P.J. O'Rourke Quote To...Frederich Nietzsche?! Sunday NYT Book Reviewer Accidently Attributes P.J. O'Rourke Quote To...Frederich Nietzsche?! It's an easy mistake. Mixing up 19th century German philosophers and late 20th Century satirists. It's that last line that caught a NYTPicker reader off guard. Our emailer didn't recall Nietzsche making many, you know, home decorating references in his essays. (Although in fact the controversial philosopher did publish a book called The Gay Science.) So we all looked it up and discovered some misinformation on the web. Apparently a lot of quote books wrongly give the nod to Nietzsche on this one. To be a mannerly and courteous person you want only a few things from your real family: dignity, breeding, and piles of money. That's all anyone has ever wanted from a family. But all anyone gets from most families is love. And family love has nothing to do with "true love." Family love is messy, clinging, and of annoying and repetitive pattern, like bad wallpaper. We've emailed O'Rourke and Shapiro for comment. Nietzsche is dead. 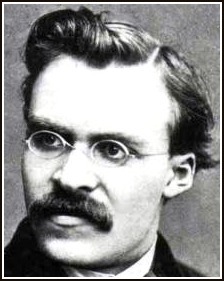 It's funny how Nietzsche is reduced to curmudgeon status, like he's Andy Rooney or something. Rhetorically connecting interior decorating to "The Gay Science" as a joke. Hm. Nietzsche and his mega-mustache, and supposed angry outbursts, and his body of work later exploited to channel and direct aggression towards evil ends. That's the imagery the reviewer fancies. Supposedly, it takes skill, to remain zen-like and blameless while provoking someone to Nietzsche-minded behavior and public embarrassment. Maybe the reviewer privately gets off on intentionally or accidentally sneaking in error and misattribution in prime NYT real-estate. And what a better note to end the decade on, than to tend to the fancies of a devoted and sworn enemy of the NYT! One of the greatest lines in NYTPicker history! Um, actually the quote IS from Nietzsche ... as quoted (or plagiarized) by P.J. O'Rourke.